Whether you’re going to dinner with your Valentine or just hanging out with your girls, you can never go wrong with a cute and festive mani. The nail art look above is perfect for Valentine’s Day and, if you swap the red for black or any other color, can be worn year-round. Read on to learn how to recreate this incredibly easy nail art look for Valentine’s Day. Apply a base coat, then paint all of your nails red. In addition to a large heart, I also incorporated mini hearts and an arrow into this nail art look, and I’ll outline how I created both below. Feel free to use one design for all of your nails or change up the design placement. With your white nail polish, create two small dots close to each other and side by side. Next, drag them downward with a toothpick to form a point. Voilà! You have a heart-shaped design. Repeat this step for each heart and be sure to space them out enough so that they don’t overlap. Create a triangle shape at the base of your nail. You can fill this in, but I left mine hollow. Draw a vertical line from the center of the triangle base. Be sure to go almost the full length of your nail, but not to the tip. Finally, create four small diagonal lines near the tip of your nail. Put two on each side. Complete your look with your favorite top coat. 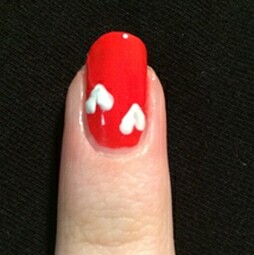 This is a fantastic nail art look for beginners and it’s such a cute and easy way to look festive for Valentine’s Day. Would you try out this nail art look? What are your Valentine’s Day plans? 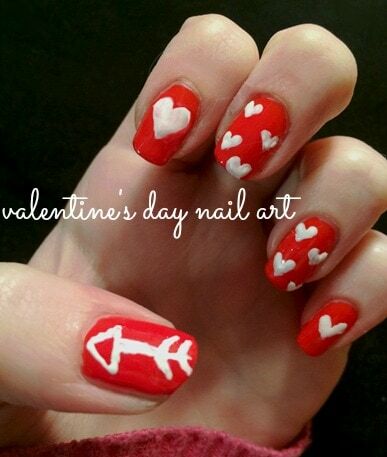 Which nail design do you like best: hearts or arrows? Tell me your thoughts by leaving a comment. If you try any of these designs, be sure to tag @collegefashion on Instagram or use the hashtag #collegefashionnails. I will be on the lookout for your photos – can’t wait to see your re-creations!